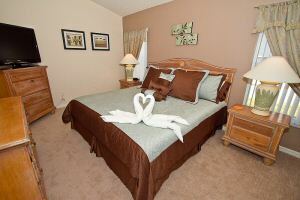 Serendipity at Indian Creek is the essence of tranquility and luxury. We pride ourselves on going that extra mile to provide finishing touches and attention to detail that turns an ordinary home into your very own personal vacation haven. From the moment you meet us online, we are with you every step of the way to help make your dream vacation as carefree as possible. We provide our guests with a warm welcome and the utmost in personal attention. We don't aim to meet or beat prices, but we do strive to provide a high quality, exceptional vacation home for those discerning guests looking for something a little extra special. With three king bedrooms, two children's theme rooms and four bathrooms, we have provided an abundance of upgrades to enhance your stay with us. 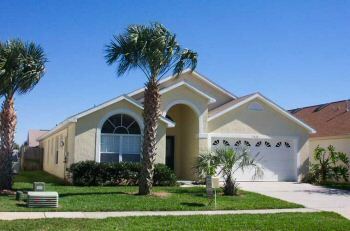 You'll find a private south facing secluded pool and hot tub, a top of the range game room with Wii Game System and 52 inch TV, broadband internet access with a pc and WiFi, a 55 inch HDTV with and surround cinema sound and 42 inch TVs in the three king suites to name just a few features. Our large and spacious open plan family room has a 55 inch HDTV with a surround cinema sound system and upgraded HD cable package. Put your feet up and sink into our sumptuous living room suite which has two reclining sofa's, a large corner unit and two reclining rocking chairs. Our 'Lift-Top' coffee tables are ideal for snacks in front of the tv or for laptops. The high cathedral ceilings have skylights offering plenty of natural daylight and the patio doors lead to the pool and sundeck. 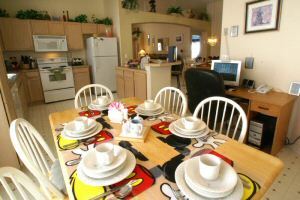 Our kitchen has everything you could possibly need whether you are preparing a light snack or a full family meal. 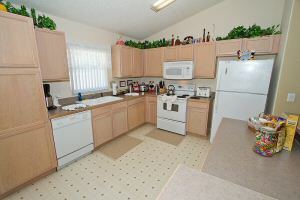 You will find the kitchen extremely well stocked with a wide range of utensils, crockery, pots, pans and time saving devices such as a crock pot, food processor, mixer and liquidizer. 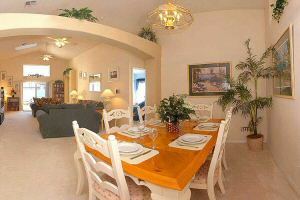 There’s a bright and sunny breakfast nook that has a dining area that seats 6. 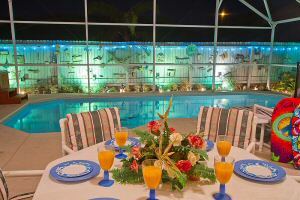 We also have a further formal dining table that seats 6 and a dining area by the pool. 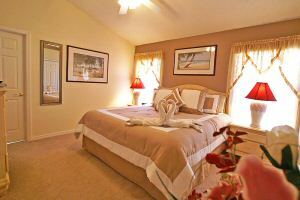 We have three king bedrooms, 2 of which are master suites and the third has a private bathroom. 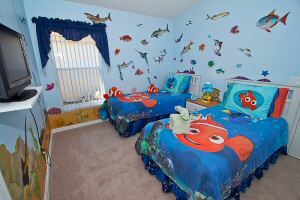 All beds have enhanced pillow top mattresses with high quality linens and plenty of plush pillows and each bedroom has a 42 inch HDTV, dvd player, cable tv and ceiling fan. The bathrooms have hairdryers and straighteners and plenty of luxury towels and two thick bath robes. 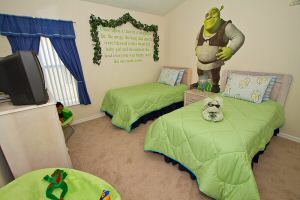 Shrek's Kingdom and Nemo's Underwater Room are wonderfully themed for children and both have twin beds with padded tops and share our fourth family bathroom. 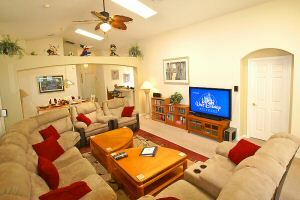 Both bedrooms both have televisions and dvd players ceiling fans. 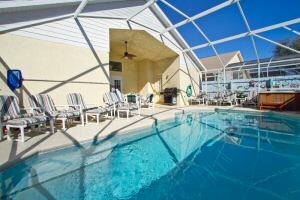 Our private pool, hot tub and sundeck are south facing so you can enjoy the glorious Florida sunshine all day long. 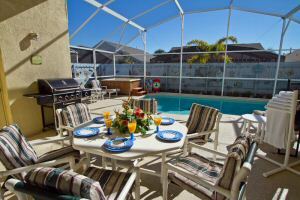 The whole area is surrounded by an attractive beach themed fence giving you complete privacy and the area is fully screened to let the sun in and keep the bugs out. For the winter months, we have a gas heating system that guarantees toasty warm water always. The pool area and rear yard are beautifully lit in the evenings with thousands of gently twinkling lights making the atmosphere perfect to unwind and relax by the pool. 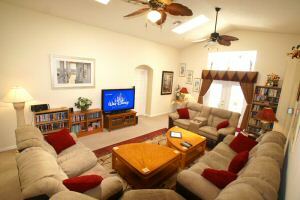 The spacious lanai and patio area offer welcome shade from the sun and has a dining area and a gas BBQ. 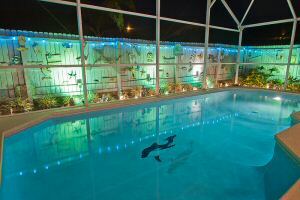 You will find plenty of padded pool furniture including sun loungers, reclining chairs, sun chairs and foot stools. For the protection of the little ones, there is a safety fence separating all access areas to the pool and, as an added precaution, the patio doors are also alarmed. 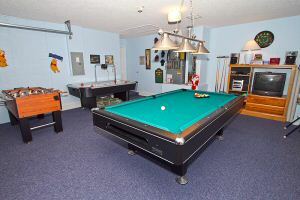 Our game room is a huge hit with all ages and has an 8 foot slate bed pool table, a 7 foot professional air hockey table, foosball, a 52 inch TV with a Wii Game System and Playstation 3. 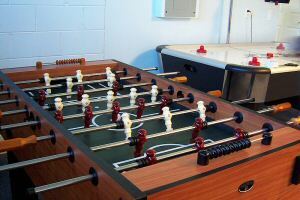 There are also plenty of boardgames for children and adults.